Every business, whether home-based or filling a corner of a business park, needs a good lawyer. 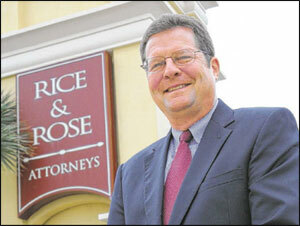 So says James Rose, a managing partner of Rice & Rose, a Daytona Beachbased law firm that opened in 1982. The firm, whose other managing partner is Paul Rice Jr., specializes in business law, family law, criminal law, wills, trusts, probate and real estate law. Rose is also active in the community. In January, he is set to become board chairman of the Daytona Regional Chamber of Commerce. He is also serves on the board of directors for United Way of Volusia-Flagler Counties, Stewart-Marchman-Act, Tiger Bay of Volusia County and the Daytona Police Endowment Association. Rose said when hiring a business lawyer for the purpose of protecting a business, one needs to look to the credentials and experience of the members of the law firm. He said his role as a successful business person, as well as lawyer, helped him recently become chair-elect of the chamber. Rose recently spoke with the Business Report about business law and his upcoming stint as chamber chairman. How has the legal field changed since you first started? Technology helps you get work done so much faster than when I first started. For instance, when I first became a lawyer, if you wanted to check the status of a business, you had to send a letter to the Secretary of State and wait weeks for a response back. Now, you can get on (the website) Sunbiz and find out immediately. It makes things quicker and more efficient, but the speed of things can (also) work against you. It leaves the possibility of errors. When is having a business lawyer most important? At the very beginning of the process. When you think of your business team, you think of accountants, bankers and so forth, but people also need to think of their lawyer in the same way. You need to legally protect what you have and make sure you know what you’re doing. You shouldn’t wait until a business transaction or lack of a contract gets you in trouble. What are some of the most pressing issues your firm is facing currently? A lot of (business owners) come into the office with issues about not getting paid for doing work. It puts pressure on their business because if they aren’t getting paid, they can’t pay their own workers. It’s extremely important for people to have contracts that prevent them from being in situations like this. People are still shell-shocked from the (recession) and this is one of its after-effects. What are some issues your firm expects to see more or less of in the future? One thing that’s decreasing is the foreclosure issue, which is a good thing in many ways. It shows that the (real estate) market is healing from the recession. Something that we’re getting a lot of questions about is Obamacare and, with its confusion, it’s something that people are having to deal with. What’s the best way business owners can protect their business from a lawsuit being filed against them? Keeping yourself from being individually liable to the business — protecting your personal assets. Properly incorporating your business keeps you from being personally vulnerable from lawsuits against the business. Having business insurance and good contracts that don’t leave you at risk are also good ways to protect yourself. What do you hope to accomplish as chamber chairman? ground troops, if you will, in effectuating positive changes. What do you expect to be able to offer as chamber chairman in terms of insights, knowledge and perspective? As a business lawyer that has been here 31 years, I’ve been on a lot of boards, so I bring a degree of knowledge that can make processes more efficient. I’m enthusiastic that I can bring excitement to the community about all of the projects that are happening around the community, with the Hard Rock (hotel) project, the Speedway (Daytona Rising renovation) and everything else going on.